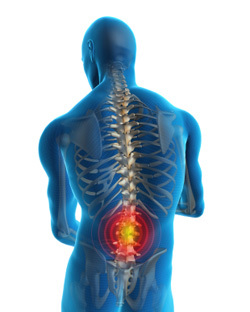 Eighty percent of Americans experience some form of back pain during their lives. Many men over age 45 are weakened by back pain than any other ailment. Making it the third most common reason for surgery. While back pain is a common condition, many different root problems can cause it. As a result, back pain can be very challenging to diagnose correctly. This is because the spine is such an incredibly complex structure of bones, muscles, nerves, joints, tendons, and ligaments. Injury or disease affecting any part of the structure can trigger an episode of pain. Muscle strains are the most common cause of lower back pain. Alternatively, the erector spinae, or large paired muscles in the lower back that help keep the spine erect, can become inflamed and seize up. In more severe cases, the pain may be caused by a degenerative condition, such as arthritis, disc disease, or a herniated disc. A degenerative disc condition can be especially problematic, as one weak point can play a pivotal role in bringing the entire structure down. For example, when a disc is not in its proper place or is malformed for any reason, it can force nearby structures to endure additional stress that can damage them as well. Now two structures are damaged, with a chance to spread the problem even further. There is no shortage of solutions for lower back pain. Rest, temperature therapy (hot or cold), and over-the-counter anti-inflammatory medicines such as aspirin or other pain relievers are often the first course of treatment for mild lower back pain. These allow the muscles to return to their normal position and begin to heal. Temperature therapy is not always feasible, however, and you probably do not want to live on drugs. Rest for a sore back should be limited to no more than two weeks as well. Otherwise, the muscles in the lower back area begin to deteriorate and become significantly weaker, leaving you open to additional pain. If your back pain continues unabated after an extended period with the above methods, chiropractic care in Spring Hill may be your ticket to lasting pain relief. For more information on lower back pain in the Spring Hill, Florida area call Accurate Chiropractic at (352) 684-2707 today! Accurate Chiropractic was established with one main focus, and that was to walk alongside the people in this community, helping them to achieve the highest level of health and wellness possible. Copyright © 2019 Accurate Chiropractic. All rights reserved.